Participants will arrive on Sunday 4 August. In the afternoon the tutors will give a recital in the chapel and after dinner the program of the week will be presented. The week will be concluded with a concert by the participants on Friday evening, the course ends after breakfast on Saturday 10 August. The course will be led by recorder players Marco Magalhães and Pedro Sousa Silva, and harpsichordist Claudio Ribeiro. Please find more information about them further on. Recorder players and harpsichordists will play in ensemble lessons and individual lessons. Focus will be on renaissance consorts, baroque trio sonatas and solo work. Registration is open for enthusiastic amateurs and students. Music will be chosen from the English renaissance and baroque repertoire. It will include composers such as John Blow, William Byrd, John Dowland, Orlando Gibbons, Anthony Holborne, Thomas Morley, Thomas Tallis, Matthew Locke, John Baston, Georg Friedrich Händel, Henry Purcell and more. Two or three harpsichords will be available and the recorder players will have the opportunity to play on a consort of renaissance recorders (A 466). With continuo we will play A 415. We will stay at the Casa de Quintã, a seventeenth century estate transformed in a hotel with all facilities. There is enough space for the lessons and a chapel for the concerts. The fee for the course is € 350 per person. The cost for accommodation is € 540 per person, based on 6 days at a shared room and full board. A small number of single rooms is available upon request and at some extra costs. The maximum number of participants is 20. You can apply by sending an e-mail to Marco Magalhães with your name and contact details, the instrument(s) you play and a short motivation. Please note that your payment of the course fee (€ 350) is the confirmation of your registration. You can apply until 31 May. If there are not enough participants at that time, the course will not take place and the payment will be refunded. Please transfer the fee before 31 May to Marco Magalhães IBAN NL27 ABNA 0596 0181 26. Feel free to contact Marco Magalhães if you have any questions: +31614407151 or marco@marcomagalhaes.com. Claudio Ribeiro was born in São Paulo in 1976. Based in The Netherlands since 2000, he is a sought-after harpsichordist and conductor in a variety of orchestras and ensembles, and co-founder and artistic director of baroque ensemble Collegium Musicum, Den Haag. Claudio is a regular guest at the major concert venues and festivals in Europe, and records for labels as RAMÉE/Outhere Music, Ricercar, Ambronay Éditions, ORF, Brilliant and Passacaille. He has won prizes as both soloist and chamber musician at the Rotary Prize for Young Instrumentalists (1999), Premio Bonporti (2011) and International Van Wassenaer Competition (2016). Claudio holds Bachelor and Master Degrees from the Royal Conservatoire in The Hague, having studied with Jacques Ogg, as well as a Bachelor degree in Conducting from the State University of Campinas where he studied harpsichord with Edmundo Hora and conducting with Eduardo Navega / Henrique Gregory. Claudio is a harpsichord teacher and correpetitor at the School for Young Talent/Royal Conservatoire The Hague since 2006, and is regularly invited to teach in festivals in Brazil and Europe. 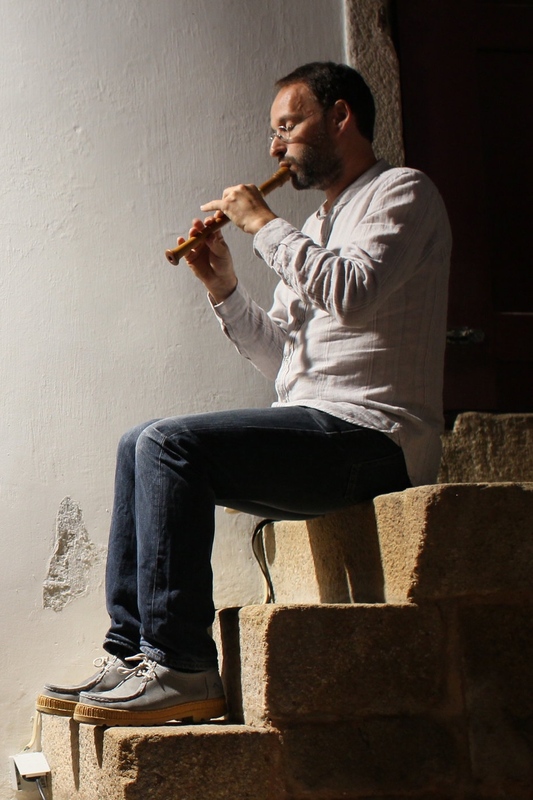 Pedro Sousa Silva studied the recorder with Pedro Couto Soares at Escola Superior de Música de Lisboa (1992-1996) and Pedro Memelsdorff at Civica Scuola di Musica di Milano (1996-2000) and Musicology at Universidade Nova de Lisboa (1999-2000). In 2010 he obtained a Doctor in Music degree at Universidade de Aveiro with a thesis that discusses the interaction between practice and theory in the performance of renaissance polyphony. As a recorder player he has been often invited to perform in countless venues in Europe. Recently, his musical activity is focused on the work with the ensembles A Imagem da Melancolia (with whom he recorded ‘Arte da Usurpação’ and ‘The Bad Tempered Consort’), Aut Tace and Arte Minima. Since 1992 he has devoted part of his time to the teaching of the recorder and early music. Presently he is Adjunct Professor at Escola Superior de Música, Artes e Espectáculo (Porto), where he founded the Early Music Department and the Post- Graduate Polyphonia. He is often welcomed by European higher education institutions to give lectures and masterclasses. Marco Magalhães holds degrees from the Escola Superior de Música de Lisboa and the Conservatorium van Amsterdam. In these institutions he worked with Pedro Sousa Silva, Pedro Couto Soares, Paul Leenhouts, Walter van Hauwe and Jorge Isaac. As a professional musician, Marco had the opportunity to play with ensembles and orchestras such as Capela Real de Lisboa, A Imagem da Melancolia, Il Dolcimelo, Concertus Antiquus, Sete Lágrimas, The Garnier Ensemble, Les Cinq Élèments, The Royal Wind Music, Orquestra Sinfónica Portuguesa, Luthers Bach Ensemble and the Prime Ensemble. He performed in Europe and the USA, in important concert halls like Casa da Música (Porto), Concertgebouw (Amsterdam), Muziekgebouw (Amsterdam), Jordan Hall (Boston) and at festivals such as the Utrecht Early Music Festival and the Festival de Musica Antigua (Barcelona). Since 2007, he recorded several CDs with a number of ensembles: Sete Lágrimas, A Imagem da Melancolia, The Royal Wind Music, Aventure and the Prime Ensemble from Antonio Politano. Marco lives in Amsterdam, where he teaches both individuals and consorts.